"Behind this (intentionally off-putting) cover lies a collection of unusual, gruesome, and striking short stories beyond compare. Davies's narratives astound in their beguiling set-ups, economic prose, and sucker punch payoffs. From two lonely settlers finding morbid companionship to darkly comedic subversions of Amazonian myth, I lost count of the number of times I was so wowed by these stories' endpoints that I instantly, eagerly, went right back to the start to reread it all over again. Bar none, one of the most surprising reads I've had in recent memory." Section Fiction / All Staff Suggestions / Fiction Suggestions / Nat M.
"Like Chekhov's great stories, Davies' . . . reward re-reading not by resolving the core mystery, but by revealing layers of meaning and complexity. " —Ladette Randolph, Ploughshares From remote Australian settlements to the snows of Siberia, from Colorado to Cumbria, restless teenagers, middle-aged civil servants, and Quaker spinsters traverse expanses of solitude to reveal the secrets of the human heart. 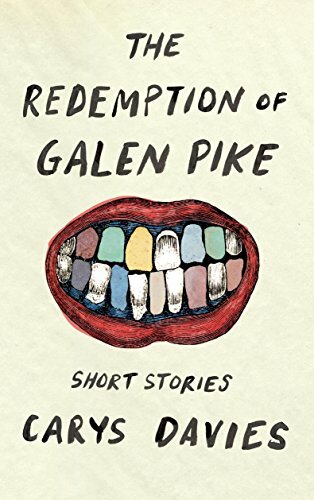 Written with raw and rigorous prose, charged throughout by a prickly wit, the stories in The Redemption of Galen Pike remind us how little we know of the lives of others. Carys Davies is currently a 2016-2017 Cullman Fellow at the New York Public Library.